This historic bridge is located about 2.6 miles from Eagle Rock in Botetourt County, Va. It is one lane across Craig's Creek on Rt. 685. The roadway is made of wood. 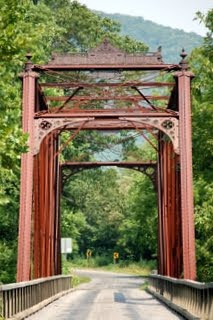 The bridge was constructed in 1887 and was one of the first steel bridges in this end of Virginia. It is called a Phoenix Bridge because it was built by The Phoenix Bridge Company of Phoenixville, Pennsylvania. The bridge is on the National Register of Historic Places. Iron instead of timber use in bridges began around 1840; two iron bridges were built across the Erie Canal in New York about that time. In 1850 an iron railroad bridge collapsed, which set the use of iron back a bit.However, by the 1860s it was in demand and after the Civil War there was a boom in bridge-building. Many companies formed to take advantage of the need, including the Phoenix Bridge Company. The Phoenix Company's distinctive product was the Phoenix post, a compression member composed of four flanged segments riveted together, which is used in this bridge. It is formed of rolled wrought iron.